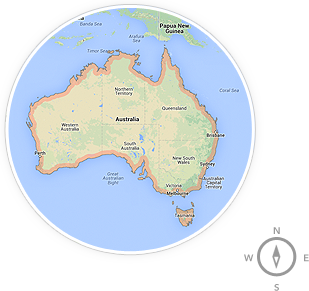 Australia is an island nation bounded by the Indian Ocean, Pacific Ocean and Southern Ocean. It comprises the mainland of the Australian continent, the island of Tasmania, and numerous smaller islands. It is the world's sixth-largest country by total area. Australia is a wealthy country – it has the twelfth largest economy and fifth highest per capita GDP. Much of Australia’s population growth is the result of immigration – around one in four Australians were born elsewhere. Melbourne, in New South Wales, reached first place on The Economist's 2011 and 2012 world's most liveable cities lists.